Beyond The Clouds is a highly character-driven film that operates at three levels, all of which are intertwined with one another. Great tragedies tend to stay with us long after the curtain call. This genre of artistic expression has the power to draw you in more than any other. The most plausible reason for this is that the human race relates to tragedy more than it does to joy or any other uplifting emotion. 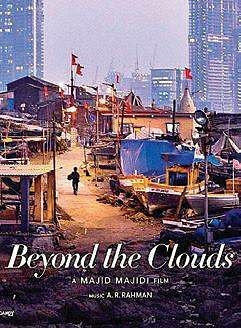 Majid Majidi’s exceptional Beyond The Clouds is every bit the crushing film it attempts to be. And Mehran Kashani’s poignant writing ensures that the characters you’re rooting for onscreen aren’t particularly better off once the credits have rolled. All this is not to suggest that the film is devoid of hope. But when those moments of upliftment are tossed aside by a jolting reality check, it puts the viewer in the most vulnerable position of all. 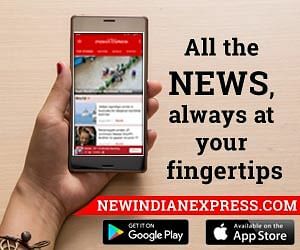 Mumbai’s seedy underbelly, its debilitating poverty, the hope that makes the city’s most disenfranchised carry on, the exploitation of the less privileged, people’s broken dreams – all these remarkable moments captured by Majidi’s vision – are reminiscent of another fine film in Mira Nair’s Salaam Bombay. It is rare for foreign directors to get a complete understanding of India in their films. The best and most recent case in point is the dreadful Slumdog Millionaire. 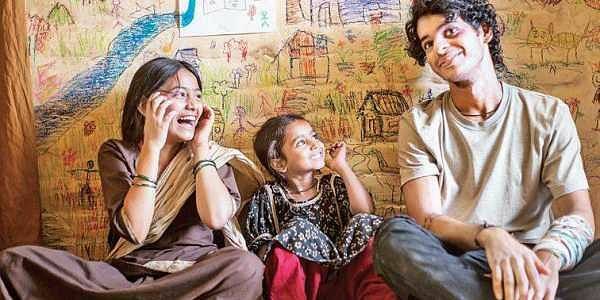 The writer-director duo of Majidi and Kashani have been extra sensitive in their portrayal of a deeply Indian tale of urban woe. It is perhaps their more eastern roots that have ensured this. At the heart of Beyond The Clouds is Amir, a cocksure young drug-runner looking to hit the jackpot and make it out of his slum-dwelling existence. His sister, Tara, is disapproving of his risky ways. On the run from a police drug bust, Amir rushes to deliver some cash to his sister. She reluctantly agrees to hold on to it, as the police give Amir chase. A neighbour, Akshi, helps Amir out as the police comb the dhobi ghaat in which the latter takes cover. The siblings have an emotionally charged conversation, and Tara heads back to retrieve her brother’s ill-gotten gains the following day. Noticing her come out of a man’s room, Akshi walks towards her while gesticulating that he has Amir’s cash with him. She follows him into an area filled with drying sheets. There, Akshi declares that Tara must not see other men, as he loves her, and that she belongs to him. Tara attempts to take the money and flee, but Akshi tries to sexually assault her. In the ensuing struggle, Tara wounds Akshi in self-defence. She is automatically thrown in prison, with her assailant fighting for his life in a Government hospital. A raging Amir is flatly informed by the cops that her case will only be taken up once Akshi wakes up and registers his statement. Until then, she will languish behind bars. Akshi does regain consciousness eventually, but he is unable to speak. Desperate to see his sister free, Amir threatens Akshi to come clean about the incident. Beyond The Clouds is a highly character-driven film that operates at three levels, all of which are intertwined with one another. First, there’s Amir and his quest for the big time. Khatter’s impressive portrayal gives us an antihero we can all root for. Though he can be violent and manipulative on occasion, he is a fully formed person with the regular range of emotions. His conscience is taken to the test several times in the narrative, but, despite the trying circumstances, he succeeds in keeping the human in him alive. Then there’s Tara, whose fear of dying in jail is kept at bay by a child she tends to when his sick mother (serving time for murdering her husband) is perpetually in and out of the hospital. And finally, we have Akshi’s family, who have the unfortunate burden of arriving on the scene and not being told the full extent of the story. While there is much love, compassion, and empathy that develops overtime amongst these characters, the director never stops reminding us of the utter hopelessness of their circumstance. As a lovely moment dawns on the audience, it is cruelly snatched away by a tragic twist of fate. Poignant from the word go, Beyond The Clouds sheds light on how far one is willing to go for the sake of those they hold dear. It scores superlatively on all the facets cinema ought to be judged on.